3D Printing technology has existed for almost 30 years now. Yet, while the Additive Manufacturing industry is still discovering new applications, new materials and new 3D printers, another technology is arising. It is called 4D Printing and is coming straight from the future! Even if we have previously introduced you to how materials change shape with this technology, in this blog post we will go together through 4D Printing technology itself, and investigate its potential and its future applications. 4D printing is the process through which a 3D printed object transforms itself into another structure over the influence of external energy input as temperature, light or other environmental stimuli. This technology is part of the project of MIT Self-assembly Lab. The purpose of this project is to combine technology and design to invent self-assembly and programmable material technologies aiming at reimagining construction, manufacturing, product assembly and performance. What is the difference between 3D Printing and 4D Printing? Obviously, 4D Printing has one more “D” than 3D Printing. What does that mean and why does it bring so much added value to the technology? 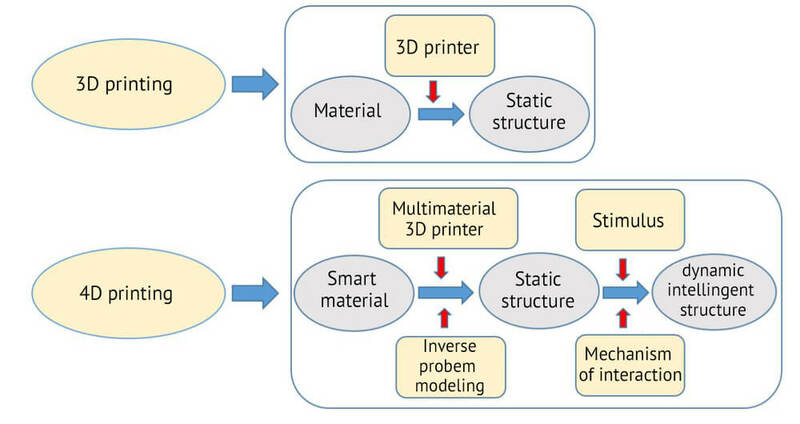 3D Printing is about repeating a 2D structure, layer by layer in a print path, from the bottom to the top, layer by layer until a 3D volume is created. 4D Printing is referred to 3D printing transforming over time. Thus, a 4th dimension is added: time. So, the big breakthrough about 4D Printing over 3D Printing is its ability to change shape over time. A 4D printed object is printed just like any 3D printed shape. The difference is that the 4D Printing technology uses programmable and advanced materials which perform a different functionality by adding hot water, light or heat. That’s why a non-living object can change its 3D shape and behavior over time. 4D printing technology uses commercial 3D printers, such as Polyjet 3D printers. The input is a “smart material”, that can be either a hydrogel or a shape memory polymer. Thanks to their thermomechanical properties and other material properties, smart materials are given the attributes of shape change and are differentiated from the common 3D printing materials. On the other hand, objects printed with 3D Printing technology, are characterized by rigidity. That means that the 3D printed objects are going to keep their 3D shape once printed. The most obvious advantage of 4D printing is that through computational folding, objects larger than printers can be printed as only one part. 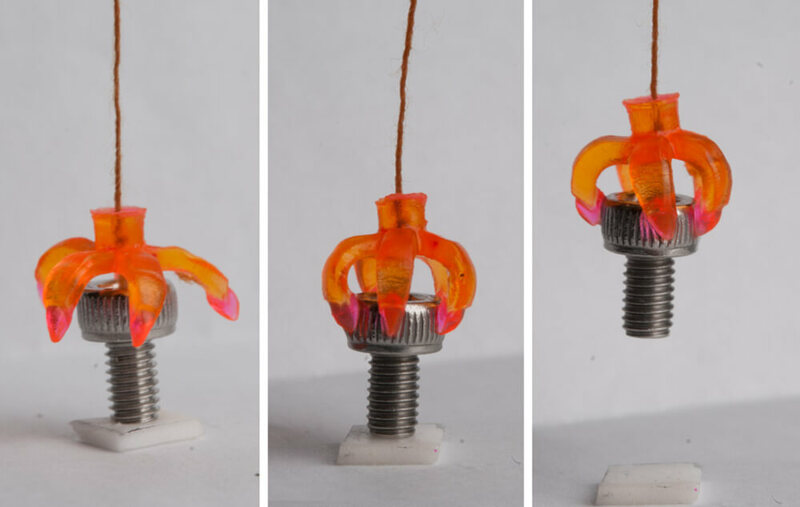 Since the 4D printed objects can change shape, can shrink and unfold, objects that are too large to fit a printer can be compressed for 3D printing into their secondary form. Another advantage of the 4D Printing technology is the usage of the possible applied materials. 4D printing has a vast potential to revolutionize the world of materials as we know it today. Imagine 4D printing being applied to a variety of smart materials that today we cannot even imagine! Until now, we have seen experiments of Multimaterial Shape Memory Polymers. Materials like the ones featured in the video below, “remember” their shape, actively transforming configurations over time in response to environmental stimuli. We have also seen an experiment with 4D printing programmable wood. What will it be next? Programmable Wood from Self-Assembly Lab, MIT. 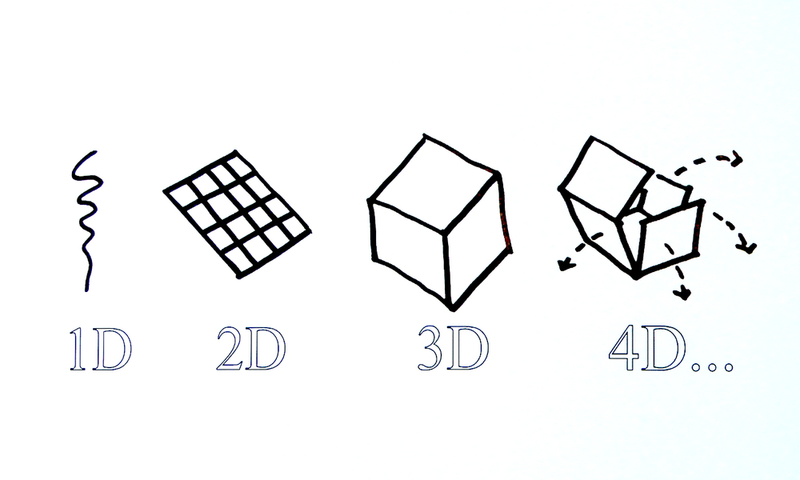 The videos above demonstrate in a very simple way the 4D Printing process. Though, even if these examples are not characterized by a great complexity, we can foresee great potential in this technology. One potential application of 4D Printing in the real world, would be pipes of a plumbing system that dynamically change their diameter in response to the flow rate and water demand. Pipes that could possibly heal themselves automatically if they crack or break, due to their ability to change in response to the environment’s change. In addition, imagine self-assembly furniture. Since 3D printing a furniture is limited by the size of the printer, 4D printing could allow to just print a flat board that will curl up into a chair by just adding water or light to it. Imagine it as a more complex version of the video below. 4D Printing: Surface to Sine Wave from Self-Assembly Lab, MIT. 4D Printing would be even more useful in big scale projects. For example, in extreme environments, such as space, it can have very promising applications. In space, currently, the 3D printing process of building causes some issues related to cost, efficiency and energy consumption. So, instead of using 3D printed materials, 4D printed materials could be used to take advantage of their transformable shape. They could provide the solution to build bridges, shelters or any kind of installations, as they would build up themselves or repair themselves in case of weather damage. On the other hand, imagine 4D printing being applied to a very small scale, in sectors such as the medicinal one. 4D printed proteins could be a great application, as the self-reconfiguring protein example illustrated in the following video. 4D Printing: Self-Folding Protein from Self-Assembly Lab, MIT. Skylar Tibbits, the inventor of the term 4D Printing and pioneer in this field, explains that it’s like a robot but that there is no micro-process nor motor. As you may already have noticed, Sculpteo tries to participate and support events related to technology as much as possible. The CEO of Sculpteo, Clement Moreau, and Simon Wenger – Mechanical Engineer at Sculpteo, attended on 17th of July a conference of the National Centre of Scientific Research on this topic: “Informed material and 4D printing: from inert to living”. It is of great importance for the team members of Sculpteo to keep up-to-date with the latest innovation in technology, in order to get inspired, exchange ideas and communicate about innovation among the scientific community. If you want to learn more about the content of the conference, here is all the related information. You may also download the presentation of Mr. Benoit Roman about the technology of 4D Printing, as well as the one of Mr. German Esteban Muniz about the EU position on 4D additive manufacturing and bio-printing. All these potential applications seem very inspiring and promising for the future indeed! 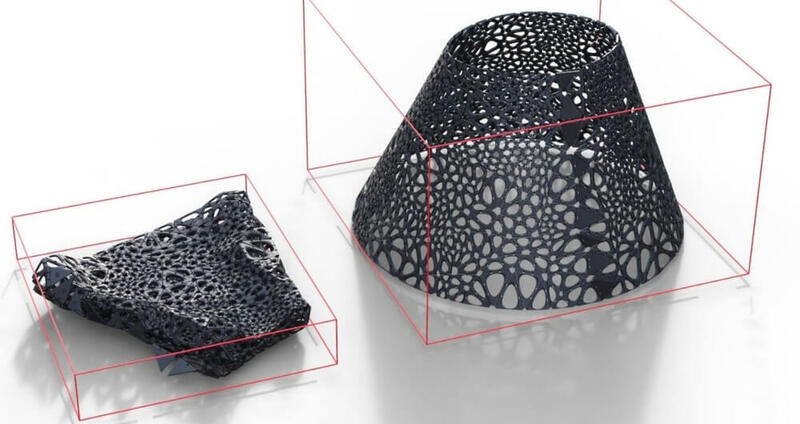 All the research conducted so far around 3D printed material properties has a lot to offer to the additive manufacturing industry and certainly contributes to its growth. Even if we are at the very beginning of the technology of 4D Printing, we can’t wait to see how it will influence the future of Additive Manufacturing, just like 3D printing revolutionized traditional manufacturing.